This year we celebrate our 50th anniversary of rescuing and rehoming animals. To kick off the year in style we have joined forces with Staffie and Stray Rescue in Bournemouth to raise awareness for the often misunderstood breed, the Staffordshire Bull Terrier. As we both see increasing numbers of Staffies needing help, the Save a Staffie campaign aims to challenge negative perceptions about the breed while showing people just what amazing family dogs Staffies can make. Calli Byrne who founded Staffie and Stray Rescue last year explains: “Sadly, the reputation of Staffies has been tarnished in recent years as they have been increasingly bred as status dogs. They became the dog of choice for people wanting a fearsome-looking dog because they look stocky and powerful. Almost all the dogs rescued by Staffie and Stray Rescue are either Staffies or Staffie crosses and added to over a fifth of all the dogs rescued by Margaret Green Animal Rescue, that’s a lot of Staffies that need rescuing. Calli Bryne from Staffie and Stray Rescue and Helen Chittock from Margaret Green Animal Rescue with Carla the Staffie! Spread the Word: Download a “Save a Staffie” poster, put it in your window and ask your local shop to display it on their notice board. Please ask your friends to put one up too. 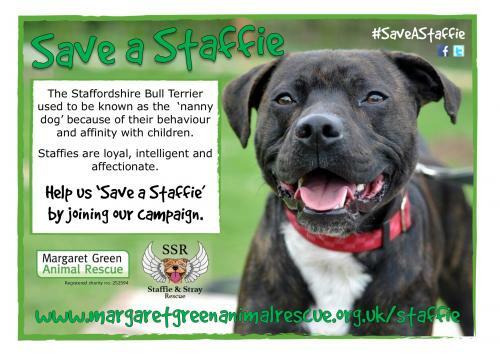 Get Social: Share your happy Staffie photos on Facebook with the hashtag #SaveaStaffie! Join the discussion on Twitter too @MGAnimalRescue and @StaffiesRescue. Volunteer: Staffies are highly intelligent and love to be around people. Volunteer to walk a Staffie at Margaret Green Animal Rescue, or ask Staffie and Stray Rescue about becoming a fosterer and make a difference to a dog’s life today. Adopt: Finally, if you are thinking of adopting a dog, please contact Margaret Green Animal Rescue on 01929 471340 or Staffie and Stray Rescue on 07450 207417.